A brand new, randomly generated, printable Samunamupure puzzle every day! In the Killer Su Doku category you will find more kinds of these puzzles, including Killer Samurai Sudoku, Killer TriDoku, Killer TwoDoku and other variants. Make sure to also check the Main page of this site, because that’s where occasionally other puzzles are posted: Kakuro (Cross Sums), Jigsaw Sudoku, Outside Sudoku, CalcuDoku, Picross (aka Hanjie, Griddlers, Nonograms). 1. All standard Sudoku rules apply. 2. Numbers in “cages” (dotted lines) must add up to the cage sum indicated for that cage. 3. 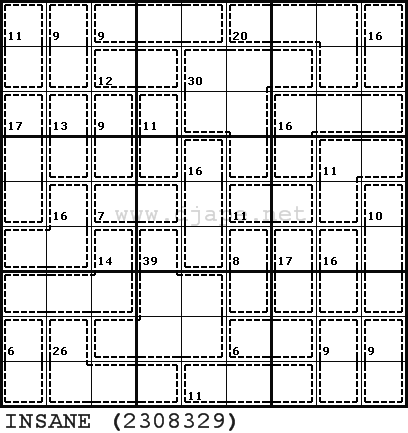 Numbers CANNOT be repeated within a cage, even if it is possible by other Sudoku rules. 4. If you see an “X” across the puzzle (diagonals) it means that numbers CANNOT be repeated on those diagonals. Rule of 45: Innies and Outies Cage Splitting Complex Innies and Outies, part 1 Complex Innies and Outies, part 2 Finally, if you need help with cage sum combinations, use the Killer Su Doku, Kakuro and CalcuDoku calculator. Previous puzzles are available in the archive Enjoy! $0.99. Active content Killer sudoku puzzle game for Kindle. the new Kindle, Kindle DX, Kindle 2nd/3rd generation. The daily puzzle did not update yet for January 2? Still no update….Two days without puzzles….Going through withdrawal! Everything ok in the home office? I’m missing the new puzzles, too. Maybe the “home office” is taking a well-deserved holiday? I hope they’ll be back soon. Sorry to say, but all I can see for 3 days now is a Samunamupure puzzle dated Saturday 4th January. Can we please have the regular Killer back? Thanks. This is true for me too, hope our compiler is OK? Glad to see a new puzzle today. Welcome back! I love these sudoku puzzles. Thanks! As requested, I have liked you on Facebook, but still no daily killer to be seen. It says to unlike and like again, but how do I unlike? Mike, just point the mouse to the “Like” button and there should appear a small “x”, which, when clicked, “unlikes” the page. Then like again. You might need to reload the page afterwards. If it doesn’t work let me know. This is utterly infuriating. I do not have facebook. I do not want facebook. I will not subscribe to facebook just to get a puzzle that I used to be able to get just by going to this website. Fix it or you’ll lose a follower. I agree Susan – utter nonsense! I totally agree—this is crazy having to sign in at a certain time—i enjoy my privacy and love DJAPE, but willl never become a Facebook user. This Facebook thing is not working! I have “”liked” and the variant still does not show, even for the first 15 minutes of the hour! At first the Killer showed up and I could print it, and now that does not appear! I access the puzzles from work in my lunch break – which is from 12:30 to 13:30, and facebook is blocked at work (and even if it wasn’t, I would never use it), so now I can’t print the puzzles off to take to lunch with me. Thanks! DJA did email me, and said that he had changed the 15 minutes to 30. I emailed him back as this initially only applied to the main killer page and not the archive, and yesterday I was able to access the archive just after noon GMT. I thnk he has recognised mine and numerous other comments in this thread and responded – well done for taking notice of the users! No puzzles today? All I see are ads. Also can’t get to your archive. DJA has chnaged the rules and you have to be a user of facebook – aaarrrgh! I am a Facebook user, and I can’t access it either. Sorry, but with this change you will loose all people – like me – who like your sudokus but do not want to be member of facebook (for good reasons!). It’s 8:04 on 11/23. Daily puzzle is not displaying! Ellen, you need to refresh the page. Hit SHIFT+Refresh (reload). It should work. Are you receiving payment for every new Facebook user you sign up? No, Jean, nothing like that. In fact, I do not ask you to sign up to Facebook! I ask you to “like” my page if you are already a Facebook member. If you are not a Facebook member, you can still access the daily sudoku puzzles from :00 to :30 any hour of the day! I tried to access the puzzle at 08:25 PDT today and it didn’t show up. The Facebook like doesn’t seem to work using Firefox. I had to switch to Internet Explorer to get the puzzle. DJ – I have bought 5 or 6 of your books over the years. You are going to lose a valuable customer if you continue with this Facebook nonsense. Frank, what you just described is CERTAINLY a caching issue in your Firefox. You need to “force refresh” by holding the SHIFT key while pressing the refresh/reload button. And like I said a couple of times already – the whole Facebook like thing will likely go away in about a month or so. So, please bear with me. Thank you! I like your puzzles – well the IQ ones anyway – and wouldn’t mind paying for them. But I am not a Facebook member and don’t want to be. I can’t like them on Facebook and it’s painful if I can only go to your site for 30 minutes every hour. Please change this! Also, like I repeated many times, this “like” thing will go away, or at least will be much reduced, in about a month or so, definitely on January 1, 2013, if not before. So, please, bear with me for a little longer! I tried to view today’s Killer at 6:25pm, no luck. I am another avid fan of this website who does NOT use facebook. I’ve purchased all 6 killer books and 4 killer samurai books. I’m looking forward to the “facebook like thing” disappearing. Tried again at 7:03, and the puzzle did appear. Thank you, Djape! You will also lose me as a fan unless this Facebook thing ends! It has ended, hasn’t it? Lately your Zero Killers become very difficault (high IQ levels). Can you reduce some of the puzzles to low IQ and even BRAIN levels. Well, I guess I have to keep doing what I have been doing… posting puzzles of various difficulty, so everyone can choose what they prefer. My opinion is that your low IQand BRAIN levels Zero killers are more fun and enjoyable to solve, I think that most of the regular solvers are not able to solve high IQ levels. The advantage of your site is that is for regular solvers that wants to enjoy and spent one or two hours in the weekend to solve the puzzle. Frank, you are probably right. It is impossible to please everyone with one puzzle. I try to post something for someone. But I will certainly take your comment into consideration and try to post some easier Zero Killers in the future. Thanks so much for your attention and for your feedback, it means a ton to me! I love the harder IQ Zero Killers. You have only published 1 killer puzzle ever that I couldn’t solve, and that was the last Insane puzzle. Yes, it was a surprise! 🙂 I should’ve announced it before. But now, you will always get Killer Sudoku 10×10 on Saturdays! The Sunday Killer Sudoku is always my weekly favorite. Yesterday’s killer Sudoku (Sunday 6 October 2013) was exceptional, the way all numbers fell in place, pure artistry! Or am I getting ahead of myself? You’re the best Djape. Tried to buy some of your Kindle games on Amazon. Couldn’t get them. Wrote Amazon. They said they don’t work on Kindle Fire. Any chance of some that will work on Kindle Fire HD? Hmmm. . . Second year in a row that there’s no killer puzzle on January 2nd. Is this a trend? Correction, second year, but not in a row. The daily variant puzzle for today is missing, too. I’ve been noticing missing puzzles more frequently in the last couple of months (end of November – early December, for instance, and Pedja’s not American). Not sure what it means. The Brain killer sudoku of Sunday 5 Jan is impossible. The top line has a 3 in two squares and a 7 in three squares. These are incompatible. Brenda, you are almost right… except… well… this is a 10×10 Killer Sudoku! Which means you should use the 0, too!!! 🙂 It changes EVERYTHING! As the puzzle hasn’t changed since Jan 4 (Saturday) I don’t know how you can be discussing the Sunday puzzle that wasn’t posted. I’ve tried liking the puzzles on Facebook but it just tells me to turn platform back on which isn’t going to happen. Tried forced refresh as suggested earlier (doesn’t help). most recently, I unpinned and closed the tab, then opened a new tab, went to the main page and linked to the daily puzzle from there. Still get Saturday Jan 4 – Brain. Thanks for all the puzzles over the years. It was fun while it lasted. Withdrawal symptoms are kicking in! Is everything OK my friend? Most recent Killer Sudoku is January 4th. Most recent Killer Sudoku in the archive is for January 1st. Are you alive and well, Djape? Or are other activitoes taking priority after all these years? Understandable, but we’ll miss you. Still stuck on Jan 4 !! Missing your puzzles. No daily variants since 2 January, no daily killer since 4 January. This is not looking good. This is horrible. The withdrawal symptoms are very painful. I’m glad to hear from Christine that you yourself are evidently ok! But I speak for everyone here when I say we miss these daily killers! Can you say a word about what’s going on? I believe that Pedja maintains a small database of puzzles that are set to post automatically. From time to time he refreshes that database with new puzzles. Since the Samurais are posted only twice a week, those take longer to run out. I think it’s safe to say that, for whatever reason, he hasn’t been around to replenish the database, and thus the daily variants and the killers have run out. I suspect that the Samurais will run out before long if Pedja doesn’t come back to refill them. That is why I said previously that this extended absence of his doesn’t bode well for the future of this site. We in the online sudoku community have seen this scenario played out numerous times before. I just hope that he is well. Yikes, what do you mean by “this scenario”? By “this scenario” I mean sudoku Web site owners and software programmers just disappearing from the sudoku scene without warning and without a word. Alive and well, but moved on to other interests, apparently. It happened with Ruud (Sudocue), it happened with Jean-Christophe (JSudoku), and with others less well known and too numerous to name. I guess it’s not too surprising–the sudoku “craze” is mostly over, and only the die-hards are left. I’m not sure there was ever a lot of money in it. Most of those who produce puzzles and sudoku software do it because they themselves enjoy it. I wish Pedja well, whatever he decides to do. He has been one of the more prolific puzzle producers over the years, and for that I’m grateful. There are many good puzzles out there on the Internet if you know where to look (and many more still being produced), and several good programs (including Ruud’s and Jean-Christophe’s) that generate puzzles. I see that Pedja posted here on the 5th, which confirms that he is alive and well. The question remains, however, whether he intends to continue posting new puzzles to this site. Can anyone provide a hint for attacking the “2308329” puzzle? The 7 in line 8 only goes to position 2 in this line. Those three sum up to 23 (because of “rule of 45” used on rows 8 and 9). Thus only 6,8 and 9 can be in these three. No 7 there.